OD Facility to Attend Departmental Tests, Application Form for Applying for attend Tests. On Duty facility to attend APPSC or TSPSC Departmental Tests and Letter For Applying for OD Facility to Appear for the Departmental Tests. OD Facility to Attend Departmental Tests and Application Form for Applying for attend Tests, Every Government employee has to attend Department Tests for further promotions or for Grant of Automatic advancement Scheme (AAS) Scale and other benefits, to get the promotion to Panel Grade Headmasters (PG HM Gr-II or PG HM Gr-I). Special Language Test-Telugu (Higher Standard) (Paper Code: 37 ) is also useful for the teachers who opted other than Telugu subject as second language in Intermediate/ Graduation. 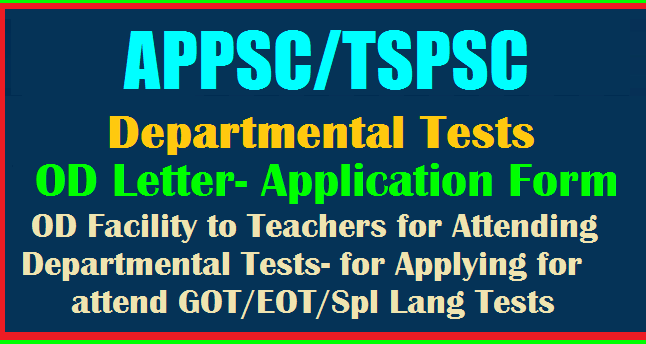 ON DUTY for Departmental Tests - OD facility to attend APPSC /TSPSC Departmental Tests as per FR 9(6) sub-clause (b)(iii) On Duty (OD) Application Form download. 1. On Duty Facility provided as per AP Fundamental Rules -FR 9(6) sub-clause (b) (iii) to attend APPSC Departmental Tests. 2. For attending these Departmental Tests, the Fundamental Rules provides "On Duty Facility for appearing these exams for Twice only". "The number of days actually required by a Government servant for proceeding to and returning from the station at which an obligatory departmental examination or an optional departmental examination which he is permitted to attend is held will be treated as a period of duty in addition to the day or days of examination. The concession shall not be granted more than twice for the optional examination". 4. As per above Rule , we should note that Now-a-days it takes only hours of journey, as these departmental tests are conducted in every district headquarters. So that, only the Examination day can be treated as period of duty. i) If the Teacher working in Primary or Upper Primary schools , MEO is the Sanctioning authority. ii) If the Teacher working in High schools , Concerned school HM is the Sanctioning authority. 2. For that, the concerned applicant has to apply to the leave sanctioning authority along with the Xerox copy of Hall Ticket for sanction of OD facility on the examination day. Here we should note that as now-a-days it takes only hours of journey, as these departmental tests are conducted in every district headquarters, only the examination day can be treated as period of duty. For that, the concerned applicant has to apply to the leave sanctioning authority along with the Xerox copy of Hall Ticket for sanction of OD facility on the examination day.